Did you ever hear the phrase “it’s that time of year to…”? Well, for me it’s always that time of year to griddle. Griddle outside or inside, it really doesn’t matter, nothing beats a great griddle and food that’s prepared properly on a griddle is delicious and nourishing. Outdoor griddles are exceptionally good additions to any barbeque station and in all honesty, a must to have. Now there are two types of outdoor griddles, the portable tops that can be used indoors and outdoors, and the portable propane gas griddles that are designed for outdoor use only. 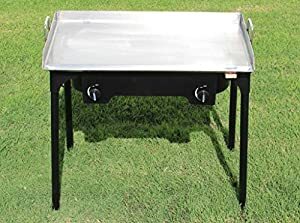 I recommend both types; I have a solid cast iron griddle top for indoor cooking and a portable outdoor gas griddle that I use for picnics and camping. 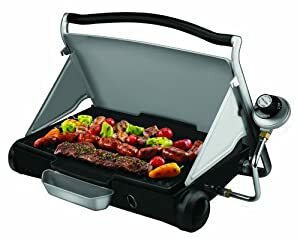 The indoor griddle top can be used outdoors, placed over a standard barbeque if you don’t want to have too many portable pieces of equipment to carry. A griddle is a flat piece of metal that is heated up, and you either fry dry or fry with oil or butter on its surface. Basically, a griddle is a large heating platform used to cook a lot of food at one go. The choice of the griddle is wholly dependent on your needs. Do you like to griddle outdoors at home? Do you want to take one with you when you go camping? Do you want one for the indoors as well? Based on these questions and the frequency you use the griddle, this guide will help you to the budget range you are prepared to reach. Another factor is material, a good griddle is made of cast iron, and cooking on cast iron is an art, you have to learn how to manage this amazing surface medium and pull out the best from its capabilities. What you do need to watch out for is thin or poor materials. You do not want a griddle that heats up unevenly, this leads to hot and cold spots and produces mixed results which are really bad. So, for quality issues, make sure you are buying a quality item. One tip: enjoy being creative on a griddle, that’s what it’s for, find that perfect balance between texture and deliciousness, and you will never want to cook without a griddle again. I have made life easier for you and listed here 15 of the best griddles on the market today. These include both griddle tops and portable gas griddles. I’ll kick off with this cool, small, portable gas-powered griddle unit. This is a great little griddle for those camping and picnic gigs. It weighs in at 25Lbs so its heavy enough to be solid and reliable and it connects to a 1 Lb propane gas tank. The top is easy to clean, being stainless steel. Once cool you just wipe it off. It spreads the heat nicely so you don’t get hot spots and it comes with a built-in grease catcher. Bottom line: The top is heated with an H-shaped burner, so you do get an even distribution of heat. Its small enough to be totally portable and big enough to prepare a good meal. However, if you plan on cooking for a large family group, or over 8 people, this might be a tad too small for you. 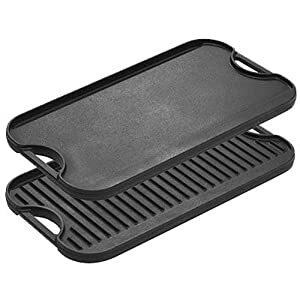 This is a great instant griddle for small groups, and only because you don’t want to stand over it for 2 hours. Now it’s time to introduce my favorite, and only because it’s simple and straightforward to use. A plain old piece of iron. 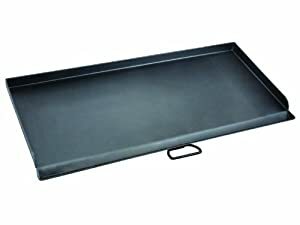 This flat top griddle is made of heavy duty steel, which is stronger and more reliable than cast iron. It’s easy to clean and won’t rust. 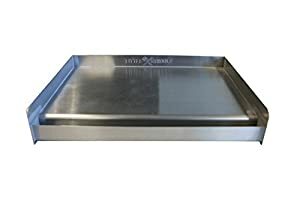 This griddle comes with heat diffuser plates to make sure the heat is distributed evenly, and it includes grease drain channels to help remove the grease quickly. This is a big one, its dimensions are 16″ x 38″ (592 sq. in), and it weighs in at 42 Lbs , so it’s hefty too. Since it’s a griddle top, you will need a heating surface. Any surface will do, from your indoor gas or electric cooker top to an outdoor barbeque, or even a campfire. This particular model will fit over the Camp Chef 16″ Cooking System stoves (three burner models). 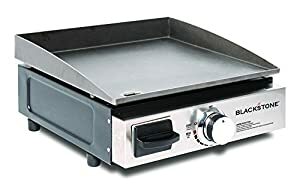 If a stand-alone griddle top is not for you, and you still want that big surface and a sturdy, reliable griddle., then you will need the Blackstone 36” station. This is hotel and restaurant quality equipment and is one of the best on the market. Where to start, dimensions; its 62.5” x 22” x 36” and weighs in at 118Lbs. So, you are getting good size on a solid frame delivering heat from gas burners to a cold rolled steel surface. Yes, its cold rolled steel, which makes it especially strong and easy to clean. This baby gives you a lifetime commitment of food love. This model comes with easy to move wheels, a sturdy steel frame and a battery powered ignition burner. There are four burners heating the plate, so you can heat up 1/4 increments. Bottom line: Style. This is the one to have on your patio, and since it’s a complete station, you can cook outdoors and serve indoors. If you have a place to keep it safe from the elements in the winter, you can use it all year round. Camp Chef has a lot of experience in producing great cooking solutions. This is one of their best, the FT600. It is restaurant quality, and it is sturdy and reliable. This model comes with four burners and a stainless-steel frame. The wheels are really easy to maneuver, and the top is a non-stick steel plate. The griddles dimensions are 62.5″ 37″ x 22″, giving you a cooking surface if 604.2”. 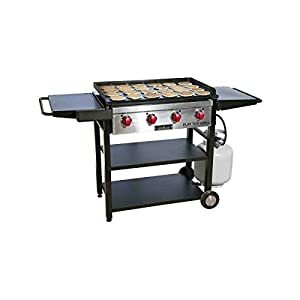 The grill unit gives you 501.2” It obviously comes with all Camp Chef additions including the electronic ignition, the shelves for storage and a grease collection system. 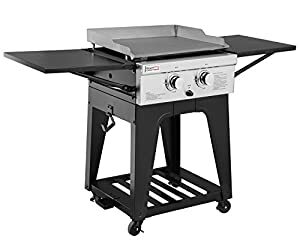 Bottom Line: A great combo unit that provides a griddle and grill in one, put this next to your barbeque and you will be able to open a family restaurant in no time. When it comes to a complete item, then you won’t get much more complete than this amazing griddle top. It’s a reversible one which means you have two sides, the flat top, and the grill top. With a flick of the wrists (yes, you will need two hands to flip this beast), you get to make anything from veggie, eggs, and toast to steak and pork chops. The dimensions of this wonderful piece of iron are 20” x 10.44,” and it will sit on any heating surface you provide. This is a cast iron unit, meaning it spreads heat like cast iron and manages heat like cast iron. You need cast iron abilities to manage it, and once you do, this will always be on your countertop at home or in the campsite over the fire. Bottom Line: This is a professional piece of metal, so wear gloves when working with this one. If you touch the side handles when it’s hot you will end up in the emergency ward. Having said this, its big enough to cook for a family, and small enough to take anywhere with ease. If its size you want, then size you will get. This 36’ surface girdle top is a Blackstone accessory only. This means that this unit will only fit on a Blackstone cooking station, so don’t buy it for any other reason. Now that we have got that under the bridge let’s take a look at this amazing piece of equipment. 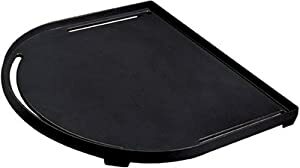 To start off with, this accessories dimension is 12” x 64” which makes this an impressive sized griddle top giving you 680.2” of cooking surface. The top is coated with powdered steel, so its easy to clean and sturdy enough to spread heat. This unit comes with a griddle cover, so you can protect it when not in use. Bottom Line: If you have the Blackstone 36” cooking station, get this too, it’s a shame to have such a great station without a griddle unit. The carry bag is also helpful for storing the accessory when not in use and protecting it from the elements. Now its time to look at small. Personal. Home cooking at its most intimate. The little griddle, aptly named, sits on any heating surface and provides a small quick griddle opportunity for any outdoor requirement. Its made of 14 Gauge steel, so its easy to clean, light to carry and thick enough to spread the heat. It comes with a grease well too and only weighs 9 Lbs. 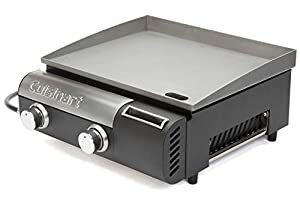 My take: You must have one of these, I don’t care if you have another griddle unit, this is a must for those quick early morning or snack time cooks of a few sausages and eggs. Don’t forget the coffee too. This is another compact griddle, only this one comes with two burners and provides a 285”2 surface for cooking. 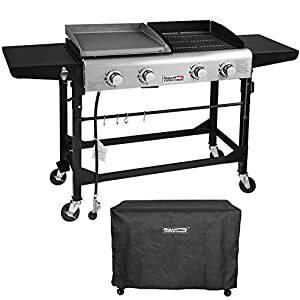 It can connect to a 1 Lb or 20 Lb propane tank, and the surface is made of cold rolled steel, giving you that extra clean and easy to manage cooking surface. There is not much to detract from this unit, in fact there are no cons, it’s all pros for this compact griddle. 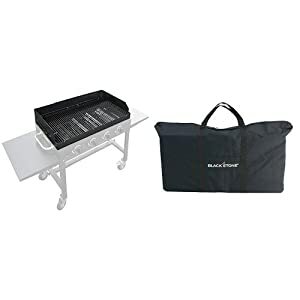 Bottom Line: if it’s for a light yet reliable cooking surface for camping or just as an outdoor addition to your patio, this makes for a great option. It’s small enough to be cozy and large enough to provide food without too much cooking time. There are griddle tops, and there are, well, griddle tops. This is a griddle top. Simple, no need to state too much, it’s a piece of iron, with grease slots, used to sit on a campfire, not to be used over a gas burner at home. Honestly, it doesn’t get simpler than this. Weighing in at 7 Lbs and 12” x 12” (144.2” cooking surface) this is a slap it on and cook unit for every camper. 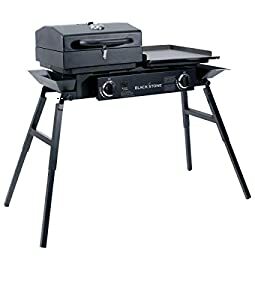 Royal Gourmet Portable Propane Gas Grill and Griddle Combo gives you that great combo surface for a perfect afternoon’s lunch, or evening barbeque. This amazing grill/griddle combo station has four burners that provide heat to two tops, one a griddle the other a grill. The total working area is 584.2” , and this unit comes with all the bells and whistles of a top-level cooking station you would find in any restaurant. Bottom Line: Each cooking surface gives you 292”2 and sits on a sturdy stainless-steel frame and four caster wheels for easy maneuverability. This model gives you electronic ignition as well as the standard grease channels and removable drip pans. Bottom Line: Another great combo unit that gives you the power of an outdoor grill and griddle. There are sometimes those unique, simple products that defy imagination, and you wonder why they were never thought of before. Well, guess what, they were thought of, and here is one of them. This is a really simple, lightweight (for its size) portable griddle unit. 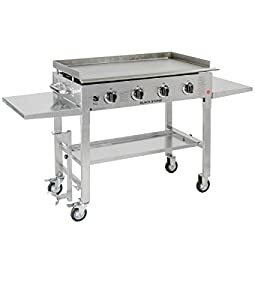 This unit comes with manual ignition and straightforward stainless steel, easy to clean top which is 32” x 17” and weighs in at 60 Lbs. Now, why rave? Simply because it’s what a portable griddle is all about. No fancy bells or whistles, just a stainless-steel griddle top over a cast iron burner unit on four legs connected to propane gas. How much simpler does it get? Bottom Line: if you want something easy to manage that produces great results, only because you are a great chef, then this is the one to get. Do you know what the difference between this griddle unit and a “restaurant” griddle unit is? Only the looks. In all honesty, a griddle is a piece of metal that heats up evenly to cook food. When you go to a restaurant you want fancy; when you go to a camp or picnic, you just want food. It’s time to talk personally. This is a personal grill and griddle unit. I’m serious; you take this when you are alone or with one other person. This little baby of a unit is so small its cooking surface is only 23 2/3” x 18” and it weighs 17.25 Lbs. The system uses a piezo ignition button and has fat drains for a fat-free cook. You connect a 1 Lb propane gas tank and get 3 hours of continuous cooking. Bottom line: the perfect camping solution, lightweight, cooks nicely and provides a perfect cooking solution for couples and individuals who love the outdoors. 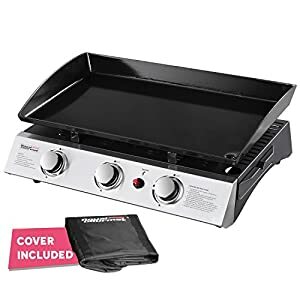 This is a great middle-sized griddle, it comes with 2 burners and a surface cooking size of 449.2” with dimensions 22.8″L x 19.7″W. This model is made of black powder covered steel and the burner is cast iron. The unit comes on a steel frame with solid caster wheels for easy maneuverability. Bottom Line: This unit spreads the heat well, it’s a middle-sized unit perfect for patios and outdoor grilling sessions. We like Blackstone, don’t we? Yes, I do, and this is one of their great portable (transportable) models. The tailgater is perfect for combining a griddle and a barbeque together. It actually comes in three combinations, so it provides a full meal preparation option. The dimensions of this model are 48.5” x 23” x 38.5” high, and it weighs 75Lbs. Bottom Line: this is a solid and steady burner unit that provides griddle options. If you are interested in camping and griddling, this is a great choice. If you are a serious griller, then you need a more professional model. I’m closing this review with the Royal Gourmet PD1300 Portable 3-Burner Propane Gas Grill Griddle. This unit is quite compact but robust. It comes with 3 burners providing a heated surface of 23.” X 12.4” which is 316.2, that’s a medium-sized range and with a total weight of only 30 Lbs, makes this one of the most portable units on the market. This model comes with a porcelain top, so you had better know how to griddle since this is not the standard cold rolled iron unit. While porcelain does clean nicely, it can be misunderstood as a cooking surface. If you are used to cold rolled iron griddles, you will need to learn a bit to get the hang of this one. Bottom Line: a perfectly light and portable solution for any campsite or picnic or even patio. This unit connects to a propane gas balloon and with a quick wipe, is clean and ready to go. The best griddle top is made of rolled steel, and you will increase your cooking experience when you season it. Seasoning a griddle top is reached by applying oil to the surface, spreading it around, and wiping off the excess, then heating it up, so it forms a blackened non-stick coating on your cooking surface. In most cases, regular cooking over time will provide seasoning. When you get your griddle, wash the surface with a good detergent. Most of the time, the surfaces come from the factory with a rust retardation oil. Before your first cook, spread your griddle top with cooking oil. As it heats up, you’ll see a brownish, black color appearing on the griddle top as the temperature rises. This is a good sign; it means your griddle top is seasoning. A seasoned top will help to prevent food from sticking to the steel surface. Another reason why you want that black color (which is essentially carbon) is that it helps give that picture-perfect coating on the outside of your food. The final reason why you want to season your griddle is that the skin you form prevents rust. When you buy a portable griddle, you have to decide what you want, a surface top to use indoors and outdoors, in this case, concentrate on the materials it is made of. If it’s a griddle station, then decide if its portable for camping, or only to be used on your patio. A patio griddle needs to be solid, and easy to clean, while a portable one needs to be light enough to carry, and easy to set up. Griddle Material: This should be cold rolled steel. You can get porcelain and other nonstick surfaces but be careful; they don’t cook the same way as the thicker metal griddles. Grilling Area: match the cooking area to the number of people you are serving. If the cooking surface is too small, you will constantly be working keep the food coming out. If the surface is too big, you will have a great griddle that is rarely used. From experience, when a griddle is too big you end up forgoing using it, it’s a weight and cleaning issue. Burners: Size defines burners, but the shape is also important. You want the burners to heat up the entire surface evenly, so you need both enough burners as well as an appropriate burner shape. In some instances, you want the griddle to come with heat diffusers that will distribute the heat evenly over larger surfaces. Wheels: Yup, portable means wheels too. When you get the bigger models the cooking stations, you want the wheels to be easily maneuverable. Obviously, the sturdier the unit, the stronger and more reliable the wheels must be. Frame: The bigger the unit, the stronger the frame. Most griddles come with a steel frame; you need a strong frame to support a heavy load as well as maintain a solid, immovable experience when handling all the food on the surface. Spatula: When griddling you will need two spatulas, the reason you want two is to make sure that when you cook different food types, you don’t contaminate either one with the flavor of the other. Scraper: You will need a good scraper, in fact, this is the most important tool of the trade, and you will be using it a lot to scrape away the excess fat, oil, and grease that accumulates as you cook. You also use the scraper before cooking a new batch of food to clean off the surface from any particles left over after the last fire. Chopper: This is also a must; a chopper is important to have at hand to chop and dice any food being prepared for the griddle. It also acts as a last resort to trim any fat or unwanted parts before you set them on the griddle surface. Oil: You need to have a bottle of oil handy for quick application. I have three oils ready, olive, sesame and vegetable. Different oils give different flavors. Basically, you can griddle anything, from packages, fried eggs, tomatoes, and fish to steak, sausages and hash browns. All you need to do is make sure you know what temperature to set the griddle, clean the surface before use and fire away. Griddles are great units for cooking up a whole meal, and if you’re really arty about griddling, you will take a pot of water and boil eggs, vegetables and even use it to steam dumplings while you braze, scorch and cook different vegetables, seafood, and meat. You can also griddle up some fancy cheese toast as well as cook up some flatbread. Take your time to get used to your griddle. Once you get familiar with it, you will enjoy creating full meals in a flash and having conversations and drinking wine while flipping food. Just make sure you don’t have anything plastic nearby, and always make sure that the surface is protected from kiddie’s hands. When grilling on grass or camping, makes sure you even the surface so that the griddle top is even too. You don’t want all the juices flowing away leaving you with dried-out meat. After you finish griddling, always, but always clean up after the surface is cooled down. Never use water to cool it quickly, that will damage the metals structure over time. Scrape the surface clean, wash with soapy water. Pull out the greased pan, wash that too and if you can clean the insides of the griddle surface.